Molly met her husband Josh when she started taking her nephew to Bear Paddle Swim School. Molly’s nephew would only swim with Coach Josh. After several weeks of practices, Molly quickly caught on that Josh would always glance her way and manage an extra “good-bye” after swim lessons. Finally, exchanged smiles turned into finding the love of her life! On a December evening, Molly & Josh went to the Brookfield Zoo Lights Festival. He waited until right before we left (carrying the ring box in his jacket under his arm the entire time so it wasn’t in his pocket for Molly to accidentally grab) - the couple was taking pictures with Molly’s nephew in front of the big tree at the entrance, when suddenly he got down on one knee and proposed, making Molly the happiest girl in the world! This modern fit-and-flare wedding dress by designer Stella York is both versatile and stylish. Lace and tulle over matte-side Lavish satin create a unique fit-and-flare silhouette that feels elevated and updated. The halter neckline is created from illusion lace over a sweetheart bodice. The lace continues through the bodice and down the hips, ending in a cascading pattern through the flared tulle skirt. There is a soft twinkle throughout the lace that adds to the richness of the gown. But perhaps the real showstopper in this gown is the low-cut illusion back. Molly had two very important patches sewn into her dress. One was gifted from her Maid of Honor and the other was a patch from Bear Paddle Swim School where the couple met. That little touch for her "something blue" made her dress even more special. We wish Molly and Josh a lifetime of love and happiness. 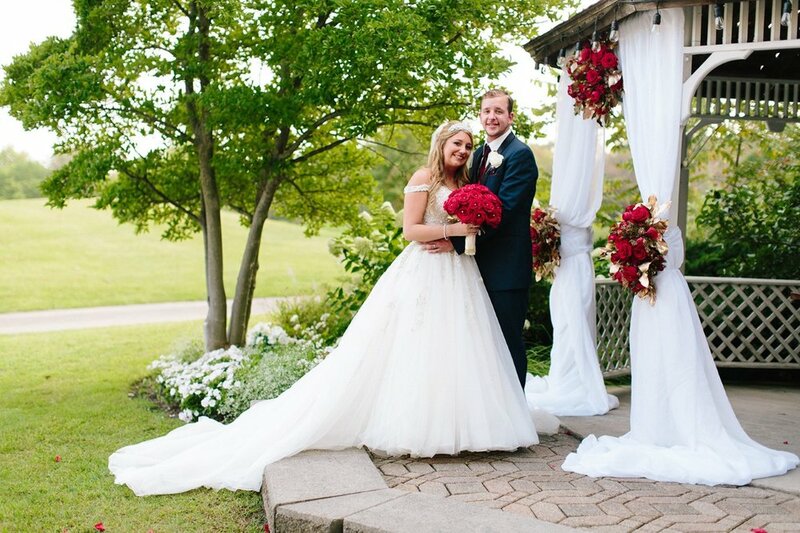 It was so much fun sharing your story and Molly looked gorgeous! 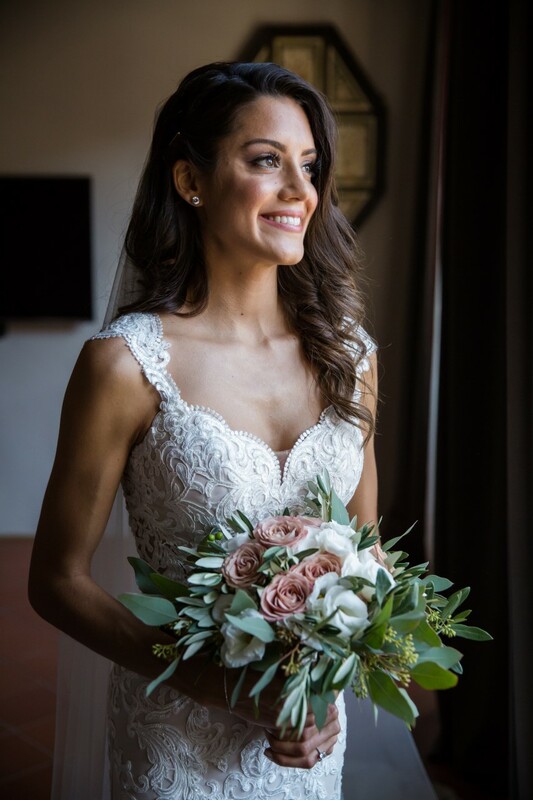 Thank you for being an HCTBRIDE! We were very spoiled with this blog post! 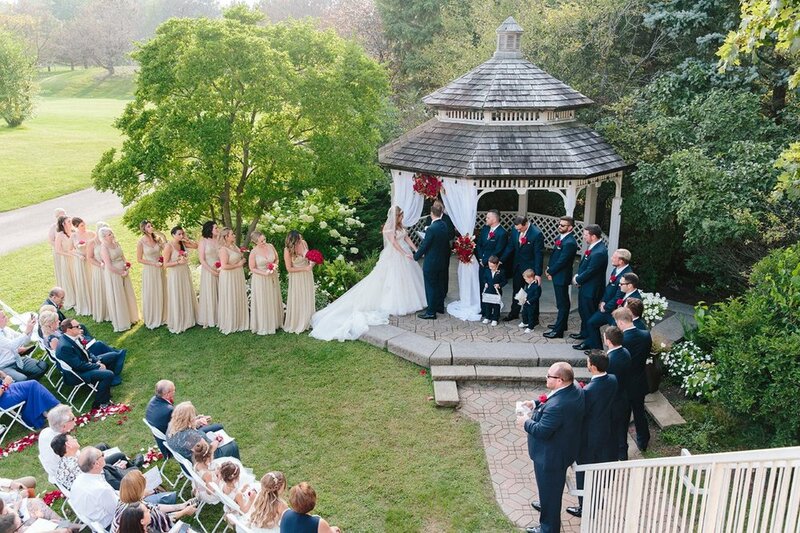 For the first time, we heard from both the bride and groom, detailing their beautiful love story! 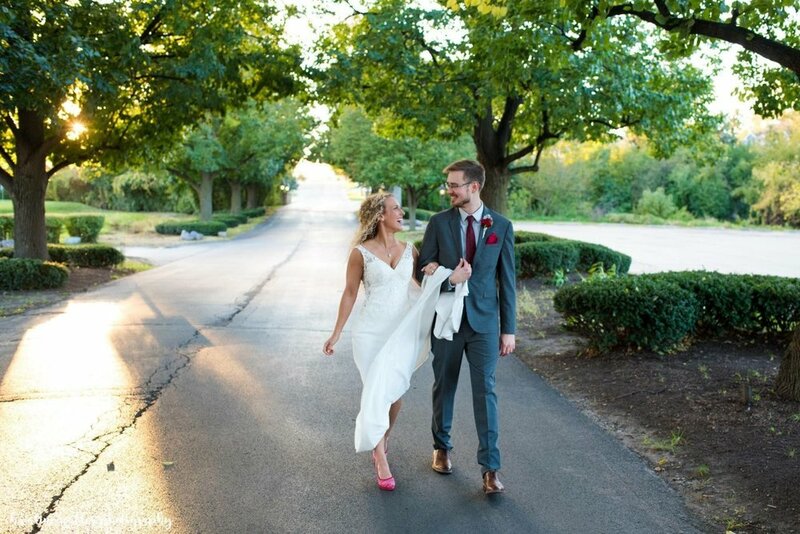 Let’s dive right in and hear all about our featured bride, Laura and her new husband Tom. From our bride, Laura: “The story of how we met goes a little something like this : Once upon a time...there was a fraternity boy who met a sorority girl.. and the rest is history. While the story of how we met goes something like that, I wouldn't call it a classic fairy tale..unless the fairy tale involves a frat party and some sorority sisters. Spring of 2010... I got the most important letter I had been waiting weeks for.. my acceptance to the University of Illinois at Urbana Champaign. While the letter told me I had been accepted, who my roommate was, and where I'd be living...it failed to mention one detail.. that I would meet my future husband at this university. Fast forward to November of 2010... I had just become initiated into my sorority and was headed out for a little celebration with my "sisters". The men of Phi Gamma Delta Fraternity had offered to throw us an initiation party. What I didn't realize until later, was fate must've been working in our favor that night. While Tom's fraternity was the one throwing the party, he considered not going because he had been tired from a long day at work. With a little persuading from his "brothers", he decided to head out. I don't know about love at first sight, but love at first sip might be a thing.. I saw cute older guy across the room playing some drinking games with a friend. With a little "liquid courage" I went over and struck up a conversation. It may or may not have started with.. "hey, where's your girlfriend tonight?" While it may have been a bold move, it must have worked because we kept in touch after that party. Dinner dates, sorority/fraternity events, and study sessions followed. Until January 21, 2011 when he asked me to be his girlfriend in my dorm room with a poster and flowers. 7 years later, here we are. Homeowners, best friends, and soon to be Mr & Mrs.
From our groom, Tom: “Since Laura and I live together, I knew that going out and buying a ring without her knowing would be tricky (especially since I am not the "sneaky-type!"). In July, Laura went on vacation with her mom to visit family in Georgia so I knew I had the perfect opportunity. I purchased the ring that week and it sat at the bottom of my sock drawer until October 16-- the day I proposed. I knew I wanted to propose during the Fall season but the details were not finalized until a couple weeks out. Our neighbors and good friends, Tim and Andrea, contacted us about going to a pumpkin farm one weekend to get pumpkins, cider donuts, and all that other good stuff! At this point, I knew I what I wanted to do. I let Tim and Andrea know and they were all on board with the plan! Shortly after the plans were set, I went over to Laura's parents house to ask her father for his blessing (he said "yes") and let them know how I was going to propose. On October 16, the possibility of rain was in the forecast...luckily it held off so I did not need to convince Laura why we had to go that day to pick up a pumpkin. As we got to Goebbert's Farm in South Barrington, I was nervous. (At one point, I looked over at Tim and asked, "Do I look like I am freaking out? Because I am!" He assured me that I looked calm.) We walked around for a while, fed giraffes, and then we came across a large "photo-op" backdrop of Cinderella and the Prince, with the Prince on one knee holding the glass slipper. Mimicking the Prince, I too got on one knee. Shocked and emotional, my Cinderella said "YES!" This modern lace mermaid wedding dress from designer Stella York takes traditional bridal fashion and gives it a much-loved twist! Lace, tulle and Regency organza over satin create an updated fit-and-flare silhouette with a dropped waist and modified V-neckline. Wide lace straps, reminiscent of delicate cap sleeves, meet and form a sheer, high back with exposed boning, which adds a couture finish to this classic dress. A long lace train and finished hemline add a hint of drama to this modern mermaid wedding dress. Laura looked absolutely gorgeous in her gown, look at all of that beautiful lace detail! Laura’s bridesmaids looked stylish in their mix and match bridesmaid dresses. They had the perfect blend of colors silhouettes to complement Laura’s moscato, mermaid gown. 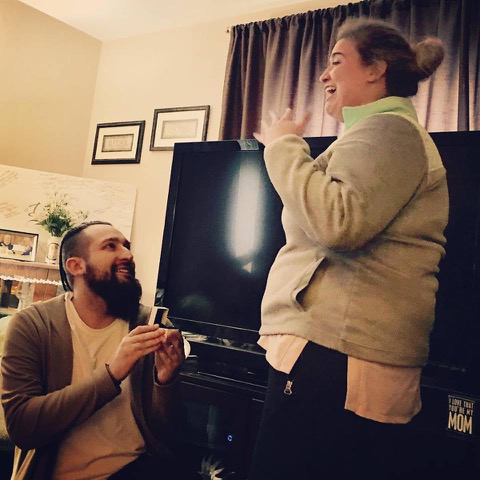 Saying “Yes!” to the fiancé was easy, but saying “Yes!” to the dress was a whole new story. I was the type of bride who postponed going wedding dress shopping partially because I had no idea what I wanted and partially because I was afraid I wouldn't look good in anything. I'm shorter and have more of a curvy hour glass shape so finding dresses that fit "just right" can be slightly challenging at times. 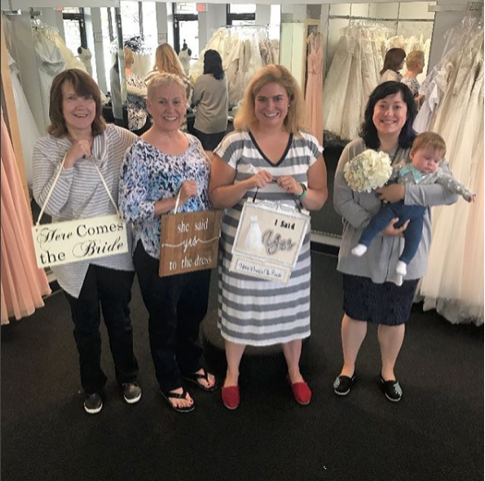 After visiting a few other bridal shops, I just knew I had to come back to HCTB because all those doubts and fears were swept away. I ended up saying "Yes!" to the dress in a beautiful Stella York mermaid lace gown in a unique "moscato" color. I just want to give a special thanks to everyone at Here Comes the Bride in Addison, IL. 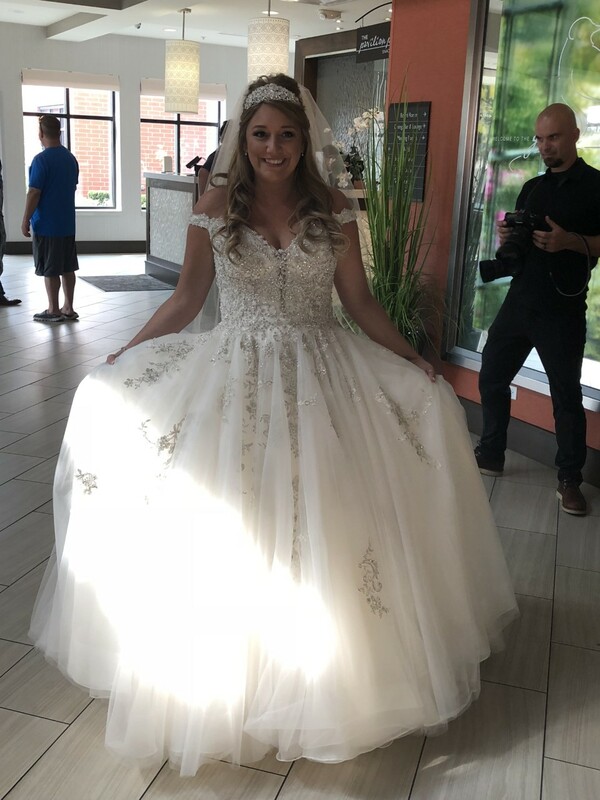 Their staff was beyond accommodating and they helped me to find the dress of my dreams!! They took my vision and made it into a reality. Their bridal consultants made me feel comfortable and at ease as we looked at the various gorgeous dresses their boutique had to offer. They had a wide selection of styles for every body type and accessories on hand to complete the look. My dress came in in a timely manner and their alterations department did amazing work to help it fit like a glove. I can't thank them enough for helping me feel beautiful and confident in the most amazing dress! I continue to recommend them to everyone I know, stating that HCTB is THE only place you should and will need to go because you will NOT be disappointed. From all of us at Here Comes the Bride, we wish Laura & Tom the very best and a lifetime full of love and happiness. 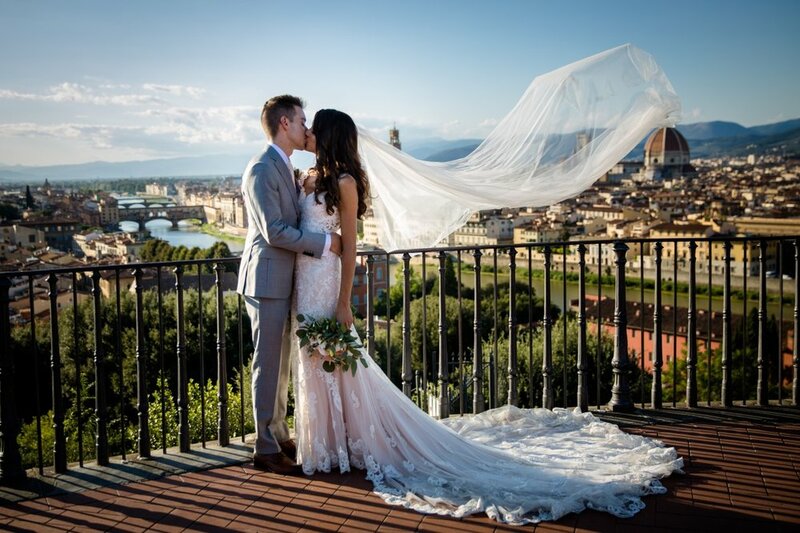 We thank you for being an #HCTBride and it was a pleasure getting to know you and sharing your story! Reception: The Bloomingdale Golf Club in Bloomingdale, IL.